IFyour end goal is to raise as much money as possible on each item in order to accomplish your fundraising mission, should you include selling artwork in your silent or live charity auctions? Whether or not art sells well comes down to two factors: having the right audience and hiring the right auctioneer. If you don’t have these two components, art often feels difficult to sell well, as many of you have likely experienced. Maybe you’ve wondered what it takes for art to sell for top dollar at your event. How art is sold and the way it is presented can make a significant difference in the financial outcome. As you consider whether to include artwork as part of your silent auction, or to place works of art among your very best live auction items, it is important to look at why art sells well and what might be missing when it flops or feels undersold, whether at the silent auction table or in the live event. How do you successfully sell art at charity auctions? S olicit desirable, recognizable artists. Artwork sells best when you cater to the likes of your audience. Consider what kind of art would sell best based on your attendees. Consider prices the majority of your audience can afford, and be proactive in choosing artists rather than being surprised by unexpected artist donations. Many groups will seek the donation of an artist they know their donor pool already collects. This is a great way for attendees to support their favorite cause while collecting their favorite artist, and at the same time the artist gains additional exposure among the collectors’ friends. In this situation, everyone benefits. Just as it is important for bidders to see that beautiful diamond necklace during the preview or read the brochure on the South Africa trip, it is important for your audience to have as much opportunity to be exposed to the artwork prior to the auction in order to maximize the interest and increase participation. Show the art online prior to your event. You can post pictures of the works and talk about the artists’ accomplishments. Include a link in communications to your attendees showing that the works of art included in this year’s event are available for preview online. If you are selling higher valued art by established artists with a known collector base, you could make a personal phone call to those attending, especially those that have been identified by the committee as art aficionados. You never know what interest those personal calls might cultivate, and if nothing else, will make your guests feel special that you knew enough about their interests to give them the advance insight. Remember, it is a best practice to prepare your audience beforehand. As you’ve no doubt realized, “prepared bidders make better bidders,” and this certainly applies to art! We all know a professional auctioneer will bring an organization more money on any given item than a volunteer Dad at a school or an organization’s favorite board member. This is especially true with artwork, however not all professional auctioneers are skilled in describing artwork. In fact, many auctioneers will admit to not liking to sell art at all! That is usually a result of not having great success selling art. 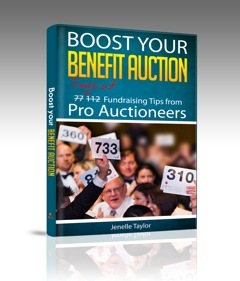 While it only takes two interested bidders for an auction item to sell well in back and forth bidding, it is the auctioneer’s job to inspire a few more attendees to make a buying decision—by giving the right information in the least amount of time—while still entertaining the rest of the audience. When your auctioneer knows what he is selling, whether it is that trip to Hawaii or a work of art, the items will sell for more.